Museum but by then most people were flagging and searching for shade. Many artefacts from Ankor Wat and some idea of the history . As usual we are lunching in such lovely local restaurants where we have 5 or 6 dishes and every one is delicate and interesting. Today it was in a restaurant where street kids are trained for jobs in the tourist trade. 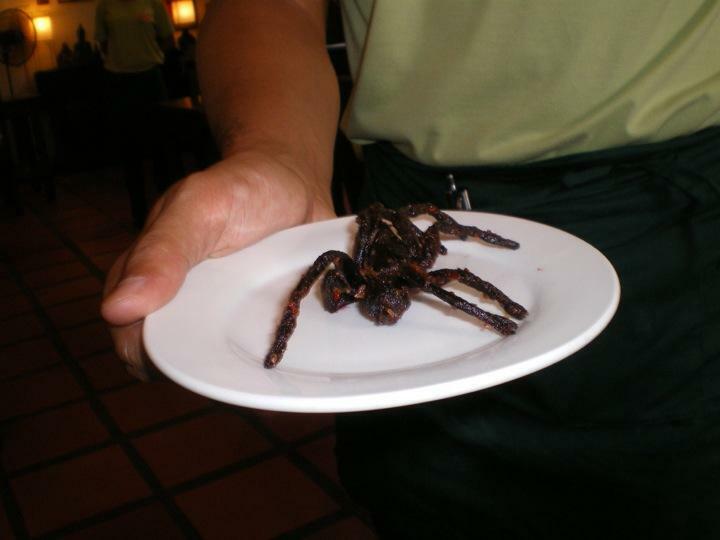 Deep fried tarantulas were on offer but no takers. Such care to present the food in colourful and varied ways. In the afternoon markets and the genocide museum for most but I took a tut tut with 3 others to the killing fields and that was a moving experience such a quiet and tranquil spot with a bloody and violent past. Cambodians have created a sensitive memorial which you wander round with an audio guide. Loud Japanese always seem to fail to understand the need to be quiet and respectful .